Do you want to create your organization’s best fundraising event ever? We all know there’s a lot of pressure when it comes to producing fundraising events. There’s pressure from your organization’s staff to raise more money for programs. There’s pressure from your board to sell more tickets. And, mostly importantly, there’s pressure you put on yourself to create an event that meets its’ goals and makes everyone proud. Now, you can move past that pressure and proceed confidently with the strategies, resources and tools you’ll get with these 4 units. 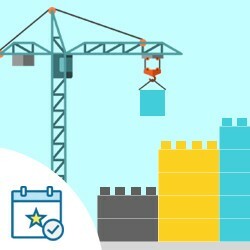 This 4-unit bundle Building Better Events takes you step-by-step through the process of crafting an event with a solid foundation that’s geared up to succeed. These four units harness the knowledge of a 20-year event planning veteran, and focus on important strategies, resources, and tools you’ll need to succeed with planning your event from the very start. If your organization wants to create fundraising events that are more meaningful and profitable, this new CharityHowTo course is for you! Lesson 3 – Timing is Everything! This Master Course will set you up for years of successful events, where you’ll learn skills that can be used on every future event you and your organization produces.